Fuel, Fuel tanks and Oil tanks. Water damage, air filter, carburateur, magneto and pont. Energic Motobineuse Type 50 to R.A.M. Energic motoculteur D9/M9 B5L as I found it! Just less than 100 km’s from the house was this rare Energic Motoculteur B5L D9/M9 on a a brass plaque. What a find. 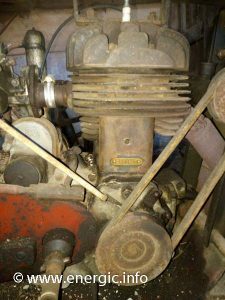 This discovery means that the very early 1931 line up had a 500cc motobecane lateral engine available in the model range for a brief period of time. Only produced for a couple of years until the introduction of the S Bloc D9, these B5L are as rare as hens teeth! In fact this is the only one I have ever seen. 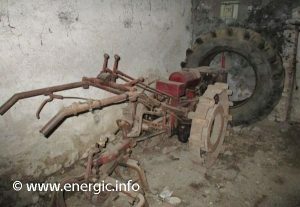 Energic motoculteur D9/M9 B5L with PTO! Will work on this soon. Read more about Energic motoculteur D9 B5L here. 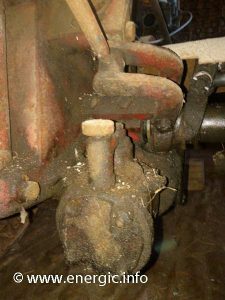 Read more about Energic Wheel clutch pins here. Read more about Energic Fan assembly and grease cups here. 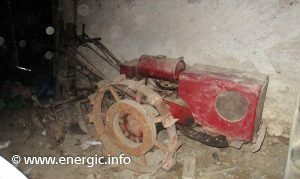 Read more about Energic Motobécane engines and history here. Read more about Energic motoculteur C7 B4L here. Read more about Energic motoculteur D9 S Bloc here. Read more about Energic motoculteur C7 S Bloc here. Read more about Energic History here. If you like my Facebook page then I can put more information on it./ Si vous aimez ma page Facebook, je peux mettre plus d’informations à ce sujet.